The point of this analysis is that the number or composition of bond versus equity will dramatically affect the risk contribution of the portfolio from each category with conventional risk parity methods. In the example above, even when considering only the 5 asset case, the distortion in risk is significant- more than 100% of risk is coming from equities for risk parity, while a whopping 80% of risk is coming from equities for ERC. 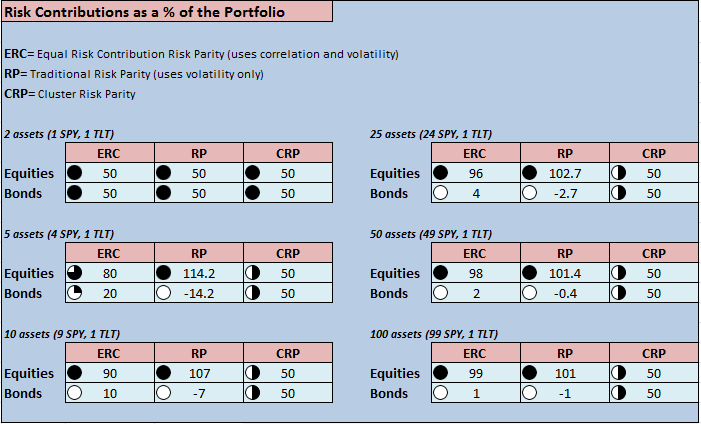 In contrast, Cluster Risk Parity (CRP) is balanced regardless of the number or composition of the universe. This helps to ensure consistency in risk management and performance and also ensure that portfolio rebalancing has the desired impact. The use of manual compilation/categorization into say “equity” or “bond” is not sufficient to avoid this problem because there are times when there is crossover (like high yield) and even significant differences within each category when correlations are low. Using CRP is the simplest way to avoid these issues without having to run a lot of ad hoc analysis and having to make continual adjustments. a) Whatever is used to slice and dice the clusters (e.g. PCA), it will depend on historical data (think correlations) – I suppose, those are not stable over time (and most definitely less stable than the “co-volatilities” used in ERC). As PCA (or other clustering methods) are exploratory, the dependency on the look back window seems to be very significant and thus allocations may be more parameter-dependent than thought. b) related to (a) I suppose there could be huge allcation shifts, as clusters suddenly flip. This may prove difficult to trade, depending on your underlyings (e.g. bonds). Hi there, thank you. I actually disagree-the clusters are very stable over time, with some methods being more stable than others. The longer the parameter, the more stable the clusters are. Keep in mind that at worst if the clustering adds no information, you are still using ERC within and across clusters, thus on average with random slicing you are going to be close to ERC anyways. ERC does contain correlations within those “co-volatilities” and hence you are subject to the same instability you are describing should it exist–of course I might mention that should they contain little information on average you will still end up with a near risk-parity weighting scheme. Since testing has shown that ERC outperforms Risk Parity, it stands to reason that there is information that is predictable contained in the correlations. In certain types of clustering methods the threshold for relationship can be large enough to be insensitive to large shifts. Contribution (ERC) � CSSA” was indeed a really awesome blog, .